Court Justice takes a three-pointer versus Piqua Friday night in the season opener for both teams. Michael Kreill led all scorers wiith 18 points versus Piqua. Tyler Montague drives toward the basket during a game at Piqu. Nick Smith drives for the basket during the Aviator’s win over Piqua. Kyle Wertz drives to the basket versus Piqua. 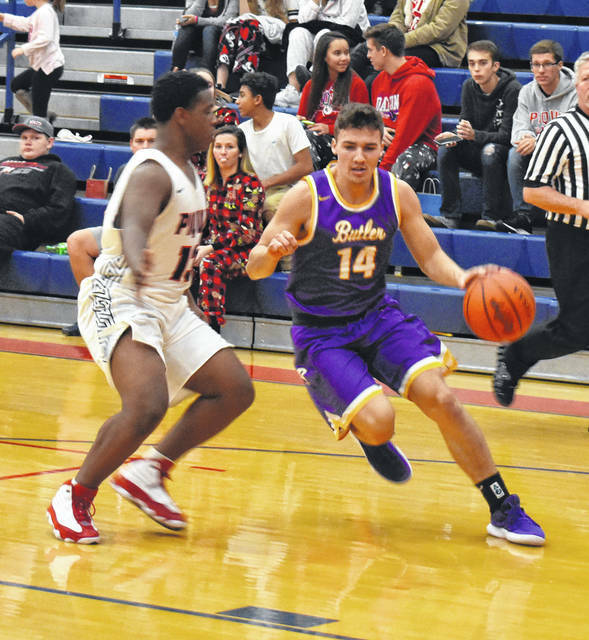 PIQUA — With the final Greater Western Ohio Conference North division title at stake, the Butler Aviators couldn’t afford a misstep in their season opener at Piqua which doubled as a league game. That was no problem because the Aviators handled business against an over-matched Indian team with ease and sent a message they would be contenders with a thorough dismantling of the host team 72-38 in the season opener for both teams. “We came out with a lot of energy and were excited to play,” said Butler head coach DJ Wyrick. That may have been an understatement given that Butler only won by 34 was something in itself given the halftime margin was 29 points. Butler shot 53% from the field and made eight three pointers while placing four players in double figures. Michael Kreill led all scorers with 18 points while Braedon Norman hit 4 three-pointers and had 14 points. Ryan Wertz had 11 and Court Justice added 10 as the Aviators overwhelmed the Indians. The Aviators never trailed after Bryant Johnson scored the game’s first basket just 17 seconds into the contest. 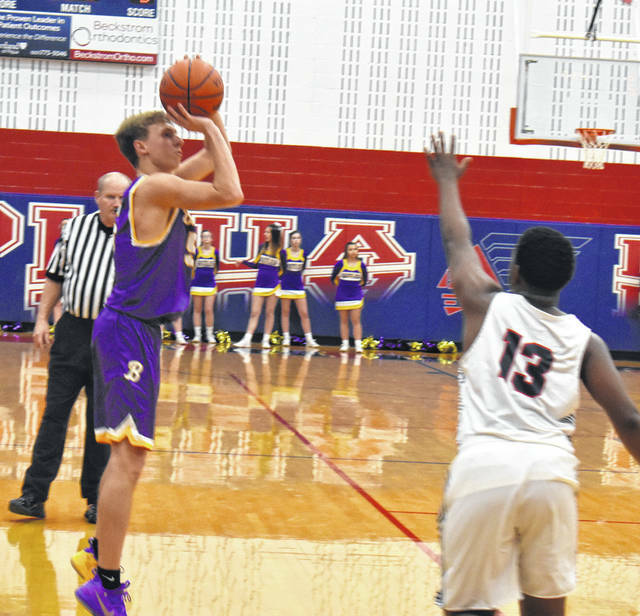 After a pair of Piqua free throws Justice connected for a three-pointer for a 5-2 lead and Butler never trailed again. Back to back three-pointers by Justice and Norman pushed the Butler lead to 15-9 and baskets by Kreill and Wertz helped the Aviators to finish the first period on a 13-4 run to take a 20-10 advantage. Johnson picked up his second foul early in the first quarter, but the Aviators went to a four-guard offense and never skipped a beat. Butler opened the second quarter with a three from Wertz and a basket by Nick Smith that opened up a 25-10 lead and forced a Piqua timeout. 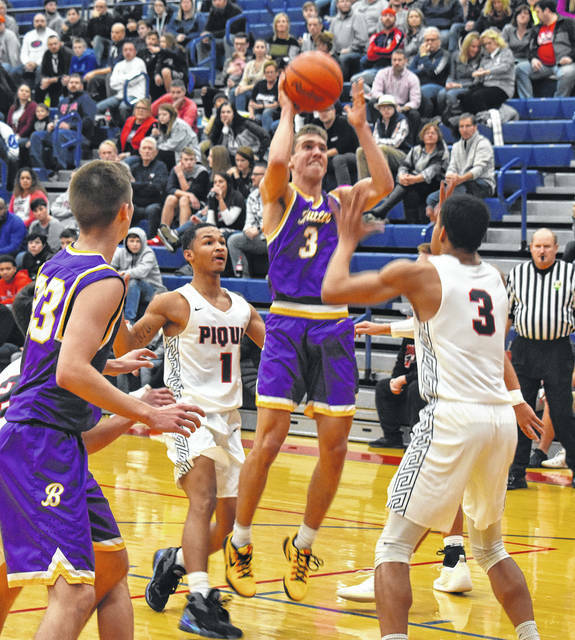 It didn’t help as the Aviators locked Piqua down on defense and finished the quarter on a 19-5 run to build a 44-15 halftime lead and put the game out of reach. Back to back three pointers by Norman in the third period and an early basket by Quentin Glover helped the Aviators build their largest lead of the game early in the final quarter at 63-35 before the benches cleared to set the final score. The three-point shot proved to be a weapon as the Aviators connected on 8-of-20 for 40% beyond the arc. Butler will return to action on Saturday when they host Springfield Shawnee. That game ended too late for this print edition. The Aviators will travel to Wayne on Tuesday in a highly anticipated match up against the Warriors. 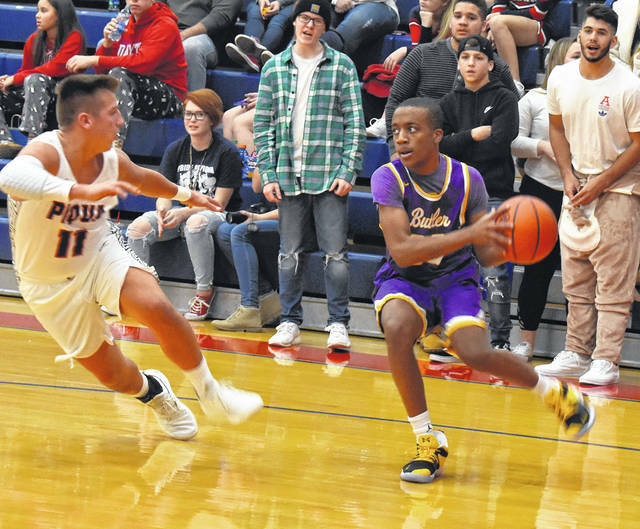 Tip time for that contest is 7:30 p.m.
https://www.vandaliadrummernews.com/wp-content/uploads/sites/19/2018/12/web1_Justice.jpgCourt Justice takes a three-pointer versus Piqua Friday night in the season opener for both teams. https://www.vandaliadrummernews.com/wp-content/uploads/sites/19/2018/12/web1_Kreill.jpgMichael Kreill led all scorers wiith 18 points versus Piqua. https://www.vandaliadrummernews.com/wp-content/uploads/sites/19/2018/12/web1_Montague.jpgTyler Montague drives toward the basket during a game at Piqu. 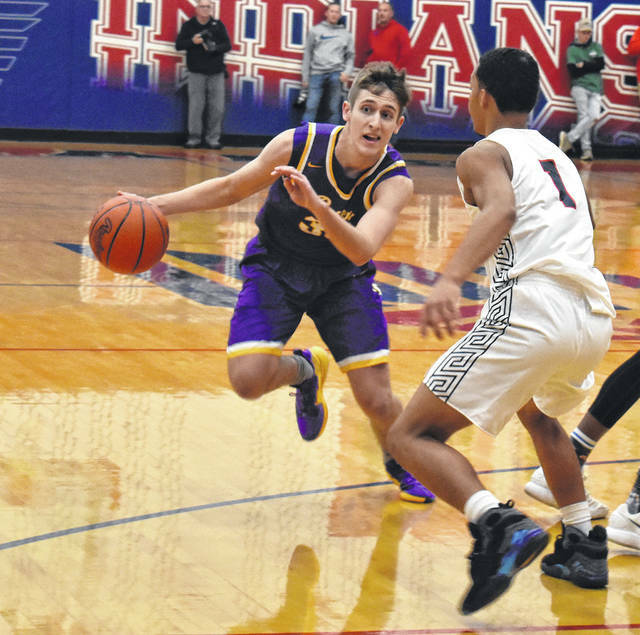 https://www.vandaliadrummernews.com/wp-content/uploads/sites/19/2018/12/web1_NickSmith.jpgNick Smith drives for the basket during the Aviator’s win over Piqua. https://www.vandaliadrummernews.com/wp-content/uploads/sites/19/2018/12/web1_Wertz.jpgKyle Wertz drives to the basket versus Piqua.